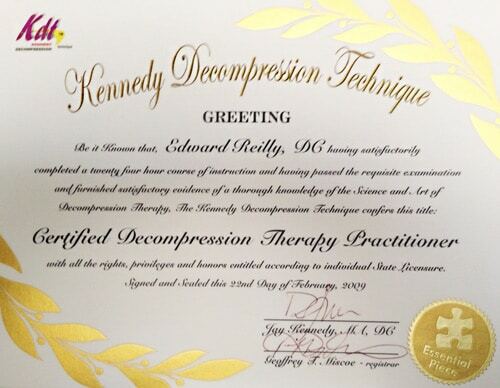 Dr. Reilly completed the Kennedy Decompression Technique course and passed the qualifying examination to achieve the status of “Certified Practitioner” in spinal decompression therapy. He has over 11 years experience using spinal decompression traction, utilizes two tables and has provided over 50,000 safe and effective treatments. He also presented this traction therapy approach to local neurosurgeons, orthopedic groups and MD’s who often refer patients to him for treatment of disc problems.